There are ways to make the most of your space; even if you don’t have a lot of it. Most potential home buyers agree that it’s easier to visualize their belongings in a space if it seems like there’s plenty of room for them. And, when someone viewing your home can visualize their things inside of it, it will be easier for them to visualize themselves living there. 1. 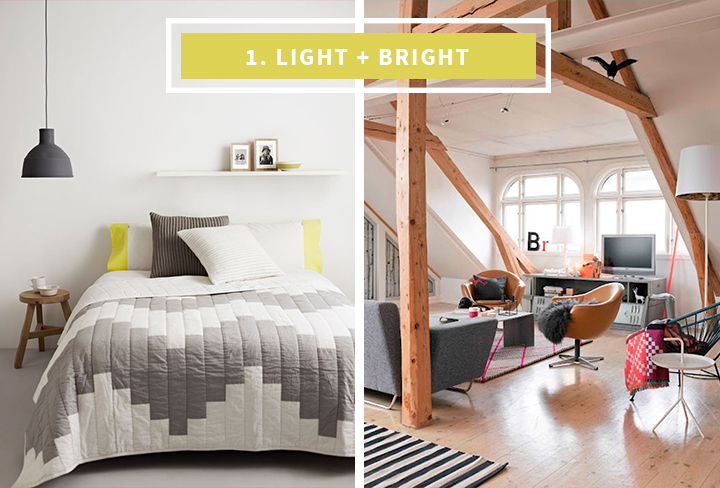 Use light colors and as much natural light as you can. Paint the walls, trim and ceiling the same color to expand the look of your room, and pull back (or remove!) the curtains on your windows. Think light, bright and airy! Want something a little more fun? Painting your ceiling a brighter color will draw the eye up and make the space feel taller. 2. 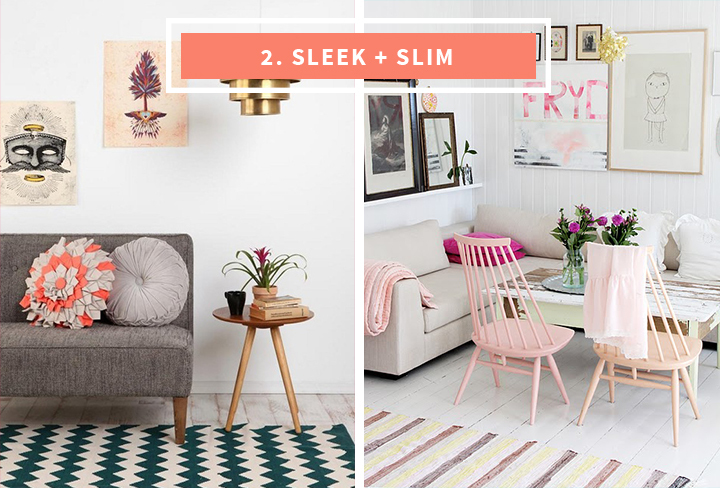 If you’re putting large pieces in your space, make sure they are slim and streamlined. A plush, poufy couch will appear to take up much more room than one that’s structured with straighter, more geometric lines. 3. 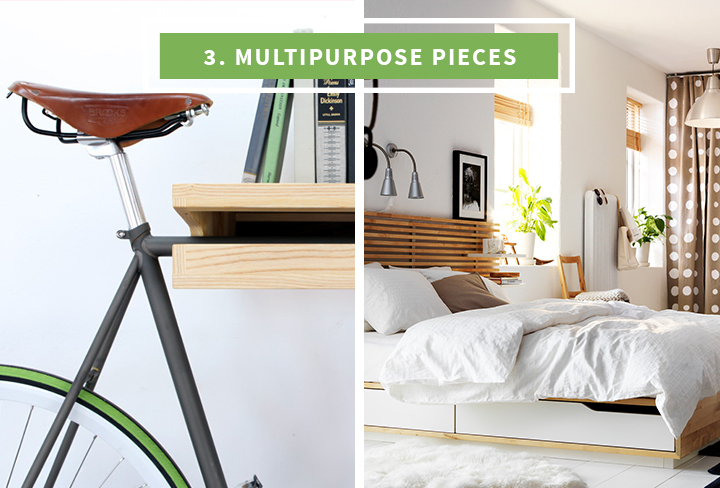 Use multipurpose pieces. Using furniture such as an ottoman that doubles as storage, or a table that also has drawers to store placemats and napkins. Under-the-bed storage is great for tucking away extra linens and pillows. How about a bike rack that doubles as a bookshelf? Now we’re thinking creatively! 4. 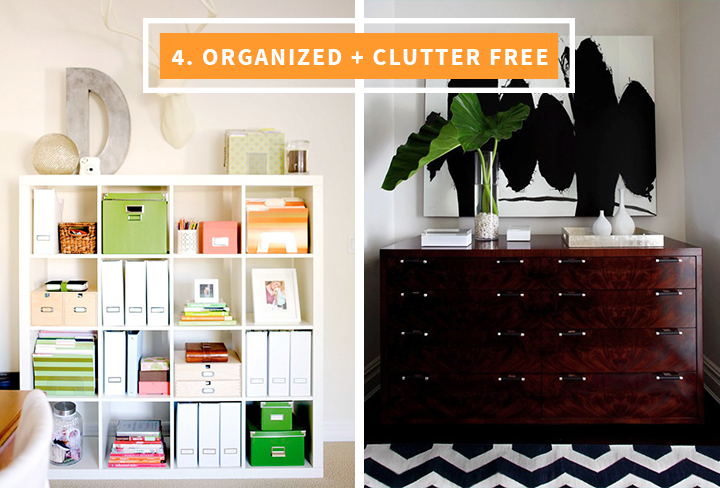 Keep things organized and clear out any clutter. Your best friends are bookshelves and pieces that can hold odds and ends and keep them out of sight. Think of using things like storage bins on bookshelves in a like color scheme to keep things looking consistent. We also like the look of a side table with drawers for stashing smaller items. 5. 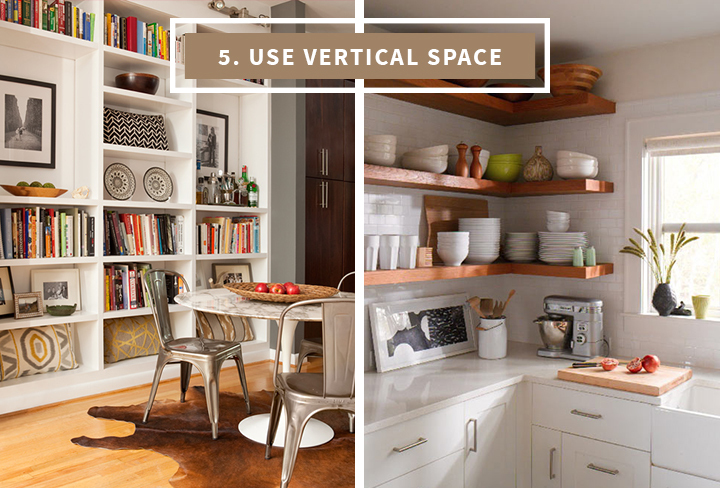 Take advantage of vertical space. Shelves are your best friend, and the higher you go with them the more they will draw eyes up, making your space look bigger. Built-ins are amazing, but you can also add your own shelving. And don’t think they’re limited to just your living room or home office; check out those kitchen shelves! They’re a great way to make a smaller kitchen work for you by putting items you don’t use as often on the top shelves.